:arrow: http://www.youtube.com/watch?v=lRpEiZn9ldA "Kielce-Disorder of History"
We're starting in Kielce. The next stop in Nowa S³upia. A small town under the mountains. The old square market is not interesting, but there are parking and bus station. And we are near entrance to ¦wiêtokrzyski National Park. During the times of prehistory of Poland, £ysa Góra was likely a sacred mountain and a site of a pagan-cult temple of three gods, mentioned in the Annals of Jan D³ugosz. There are remains of a quartzite U-shaped wall surrounding the higher part of the mountain, with length of about 1.5 km and height of 2m from 8th-10th centuries. The temple was abandoned after the baptism of Poland. The legend about witches' sabbaths is likely related to the old cult. On the site of the pagan temple the Benedictine monastery of Holy Cross (¦wiêty Krzy¿) was founded (according to a legend, in 1006, by king of Poland, Boles³aw Chrobry, but most sources give the 11th century). The monastery was named after a part from Jesus' Cross which was supposedly enshrined there, and was a site of frequent pilgrimages. The monastery was destroyed and rebuilt several times throughout its history, with the most significant destruction taking place in the 19th and 20th centuries. After partitions of Poland, the Russian Empire took over the building in 1819 and converted it into a prison. Partially restored during the interwar period after Poland regained independence, it was taken over by the Nazi Germany and used as a prison and execution site of Soviet prisoners of war (about 6000 perished here). Afterwards, the Polish communist government transferred the building to the ¦wiêtokrzyski National Park, which renovated parts of them. Currently the National Park has a museum in some of the former buildings, while a part has been taken over by another religious order (Missionary Oblates of Mary Immaculate). The abbey, although now past its Golden Age, has given its names to the ¦wiêtokrzyskie Mountains range as well as the ¦wiêtokrzyskie Voivodeship itself. The abbey also holds some mummified bodies; one of them is rumored (but not confirmed) to belong to Prince Jeremi Wi¶niowiecki. Another notable building found on the mountain is the ¦wiêty Krzy¿ TV Tower; the tallest free-standing TV tower in Poland. Built in 1966, it is a 157 metre tall concrete tower. The Soviet prisoners executed by the Nazis are buried in a mass grave near the peak. At the bottom of the mountain, there is a monument to Poles who died in the Katyn massacre. £ysica [ˈwɨˈɕit​͡sa] is the highest mountain in ¦wiêtokrzyskie Mountains of Poland. Its height is 612 metres (2,008 ft). It is located in the ¦wiêtokrzyski National Park and there is an abbey below it, on a site that might have been a pagan temple before the times of baptism of Poland. In Tokarnia there is an open-air Kielce Countryside Museum (Muzeum Wsi Kieleckiej - Park Etnograficzny w Tokarni), with examples of old countryside architecture. The museum is situated just by the European route E77 (Kielce-Kraków part). 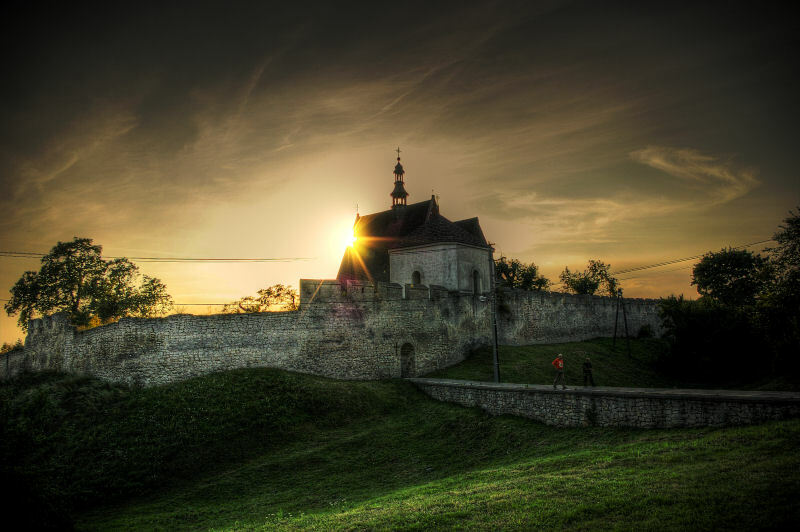 The construction of the fortress probably began in the late 13th century. It is certain that the castle existed in 1306, when king W³adys³aw I the Elbow-high gave it to the Archbishop of Kraków, Jan Muskata. A year later, under the pretext of detection of a plot against the royal power, the castle returned to the king. It played a significant role as a place of concentration of troops departing for war with the Teutonic Knights. After the death of W³adys³aw the Elbow-high the stronghold was enlarged by Casimir III the Great. At that time Chêciny become a residence of the king's second wife Adelaide of Hesse. In following years it was also a residence of Elisabeth of Poland, Queen of Hungary, Sophia of Halshany and her son W³adys³aw III of Varna and Bona Sforza. Later it was used for many years as a state prison. Among imprisoned here were Michael Küchmeister von Sternberg future Grand Master of the Teutonic Knights, Andrzej Wingold, Jogaila's half-brother and Warcis³aw of Gotartowice. In the second half of the 16th century, the castle began to decline. 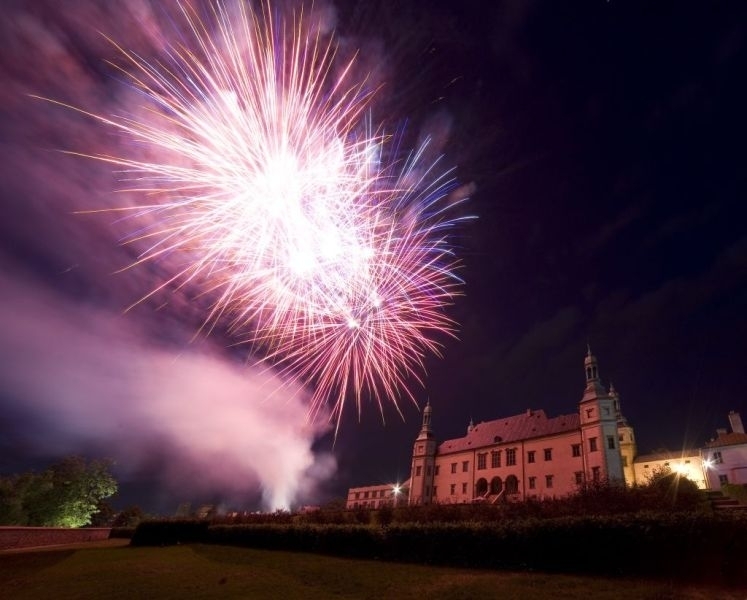 In 1588 the parliament ordered to transfer the castle's inventories to the Chêciny Church and in 1607, during the Zebrzydowski Rebellion the fortifications and buildings were partially destroyed and burned. The castle briefly regained its former glory due to reconstruction initiated by Stanis³aw Branicki, starost of Chêciny, but in 1655-1657 it was almost completely destroyed by Swedish-Brandenburgian and Transilvanian troops. The destruction was completed in 1707 during another another Swedish occupation. Then, the last residents left the castle. Over the next century the medieval walls become a source of building material for local villagers. In this area is 'Paradise Cave'. Great trip and wonderful pictures! 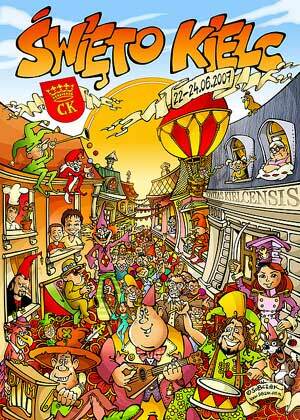 Feast Kielce is coming! 25-26 June. Again two days of fun in my city. Of course the television broadcast on TVP1, or TVP2 (20.00). This year with Doda, Bajm, Tatiana Okupnik, Natalia Kukulska, Justyna Steczkowska, Manchester, Mrozu and other polish artists. Looks better than £ód¼-version ;-) Really. I don't know how's in £od¼, but i suppose that it's similar event. So far everything was happended on Sienkiewicza Street (in £ód¼ on Piotrkowska? ), the fair, performances, parades and bonus scene for children in city park. You know baloons, ponies, and other :mrgreen: And at the end fireworks. But this year is better. Maybe you know Leszek Kumañski from TVP. He is director, scriptwriter and producer of television programs. He organizes concerts in Opole and Sopot. He was born in Kielce. ;-) And one year ago he decided to organize a big concert in his/my city. The witches' sabbath. But it was in september. In the first day of feast will the great opening of old market square after repairs. Finally looks like before World War II.